ZEAL originally started in fall of 2005. The incentive to create the program started with former UNM athletes that felt a program should be implemented based upon the need for an outlet for Black student-athletes. Once the idea for a program was considered, Scott Carreathers and Dr. Jamal Martin collaborated with one another, brainstorming the name, vision, and means of implementation for the program. Within the first couple of years of implementation, there were over 17 athletes that participated within the program, with 12 of the athletes graduating from UNM and 2 going on to become college football coaches. The pioneers and past coordinators of the program consisted of Scott Carreathers, Dr. Jamal Martin, Ron Wallace, Orlando Leavell, and James Newton. 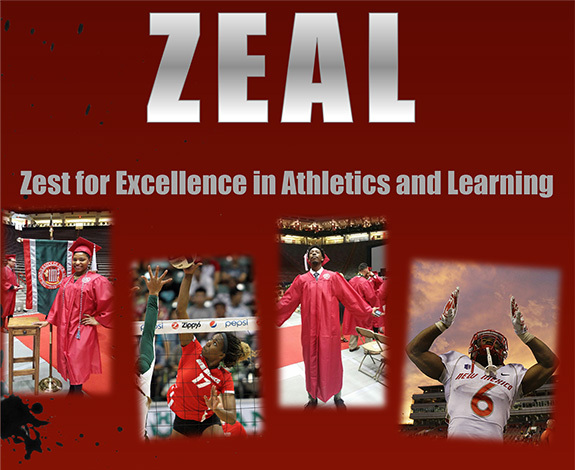 Zeal is to support retention and graduation rates for student athletes. In pursuit to attain our goal, ZEAL pledges to structure activities to improve the college experience while developing life-skills for African American male/female athletes recruited by The University of New Mexico. ZEAL, in partnership with the UNM Athletic Department, will use mentors and tutors to enhance positive behaviors among first generation and transfer student-athletes. The ZEAL program will in its endeavors continue to promote academic excellence for student athletes, University wide. What is the Future of ZEAL? Our focus lies in helping to groom Black student athletes through a holistic approach into young educated professionals who are ambitious and are ready to embrace what their future holds. These student will essentially become peer mentors to the next generation of Black student athletes at the University of New Mexico. As we continue to establish a culture of success and professionalism within the program, we will set a standard for other athletes to follow.